New York — It’s been five years since Hurricane Sandy made history as the largest Atlantic hurricane on record when it made landfall near Brigantine, N.J., on Oct. 29, 2012. With wind gusts in excess of 75 miles per hour and storm surge that inundated much of the New York and New Jersey coasts, the storm killed more than 100 Americans and caused more than $50 billion in damages. Since the storm, the U.S. Army Corps of Engineers (USACE) has supported repair and recovery efforts throughout the Northeast. Those efforts have taken place in phases as USACE first supported immediate life and safety missions on behalf of the Federal Emergency Management Agency in the days, weeks and months following the storm. Then, work shifted to repairing and restoring existing projects. Today, the focus is on constructing projects that were not yet built when the storm struck, as well as longer-term efforts to reduce risk for coastal communities. In January 2013, Congress passed the Disaster Relief Appropriations Act, which provided more than $5 billion to USACE for the restoration and construction of federal projects in impacted areas. Most of the Army Corps’ recovery program lies within the North Atlantic Division, particularly in New York and New Jersey. 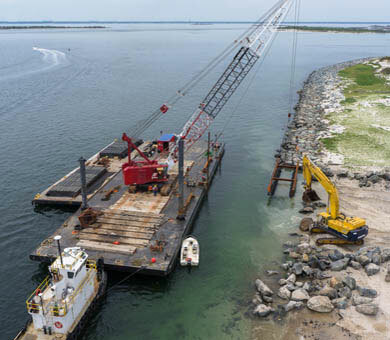 The Norfolk District’s Willoughby Spit dredge and sand placement project was completed in May of 2017, bringing the total number of completed “authorized but not yet constructed projects” to six. Between these six projects and the initial restoration of other projects, the work has been non-stop within the North Atlantic Division.. While construction continues along the coastline, USACE has also undertaken studies aimed at making communities more resilient. Congress directed USACE to conduct the North Atlantic Coast Comprehensive Study, an interagency endeavor that developed shared tools to assess coastal flood risks and identify potential solutions to reduce those risks across the region. In our nation’s capital, the study area contains a convergence of critical infrastructure that the region’s local governments, businesses, institutions and communities depend upon, including water, energy and communication utilities; transportation hubs; federal buildings and military installations; as well as significant national monuments and cultural treasures. The Washington, D.C. and Metropolitan Area Study looks at how to protect these important shared resources from flood damages. USACE teams will be looking at a suite of solutions as part of the multi-year studies, including systematic measures such as storm-surge barriers; structural measures such as seawalls and bulkheads; non-structural measures such as elevating homes; and nature-based features such as restoring marshes. While the size and shape of future solutions is still to be determined, what has already been put in place is clear and considerable. To learn more about the North Atlantic Division’s Sandy recovery progress and future plan, visit http://www.nad.usace.army.mil/Sandy.